Popular and busy for good reason, Misquamicut has lots to offer everyone, especially families. 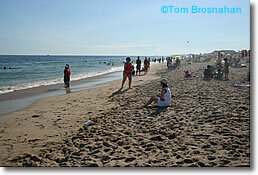 Misquamicut State Beach, south of Westerly RI and just east of Watch Hill and the Connecticut shoreline (map), draws eager beach-goers from both Rhode Island and Connecticut. Besides the l-o-n-g soft sand beach, Misquamicut has changing booths, showers and toilets, snack stands, and—best of all for the kids—Atlantic Beach Park, a classic New England beach amusement area with bumper cars, kids' rides, game arcades, miniature golf, waterslides, souvenir shops and more. North Kingston, South County RI.